Easter joy is here! Finally, the days of penitence are over and we’re called to celebrate Our Lord’s resurrection. The Mass readings focus now on the post-resurrection appearances of Jesus to the apostles and their exuberance over seeing him again. Along with the disciples, there is someone else whose exuberance we might consider — Mary. Mary, the mother of Jesus, had suffered greatly in the time preceding the resurrection. Already during his public ministry, Jesus faced opposition and death threats from the scribes and Pharisees. As close as she was to her son, Mary must have been aware of those threats as well. “But he said in reply to the one who told him, ‘Who is my mother? Who are my brothers?’ And stretching out his hand toward his disciples, he said, ‘Here are my mother and my brothers. For whoever does the will of my heavenly Father is my brother, and sister and mother'” (Mt 12:46-50). Mary wouldn’t have come to satisfy a need of her own or to interfere in her son’s mission. One can only surmise that she’d come to warn him of impending danger. When Jesus was arrested after the Last Supper, it likely caused a stir. He was big game, so to speak, for the Temple officials, and his capture would have been anticipated by many. Whether Mary was in Jerusalem at that moment or not, we don’t know. Because of their closeness, it’s almost unthinkable that Mary would not have made her way to the holy city to be with Jesus. Because of Jesus’ notoriety, Mary was sure to have heard about the scuffle in the Garden of Gethsemane. We do know that she was present as Jesus made his way up the hill of Calvary because he met her along the way. And of course, she was there at the foot of the cross as he hung dying. “Standing by the cross of Jesus were his mother and his mother’s sister, Mary the wife of Clopas, and Mary of Magdala. When Jesus saw his mother and the disciple there whom he loved, he said to his mother, ‘Woman, behold, your son.’ Then he said to the disciple, ‘Behold, your mother.’ And from that hour the disciple took her into his home” (Jn 19:25-27). 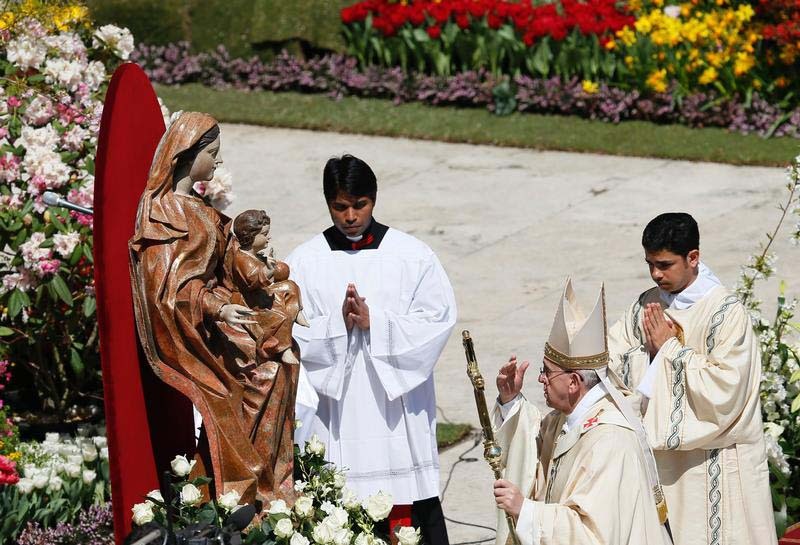 Mary faced a terrible dilemma during Jesus’ passion and crucifixion. She was, and still is, the perfect mother-child. As mother of Jesus, she would have wanted to alleviate the suffering of her tortured, dying child. As a child of God, she would have wanted to follow his holy will no matter what. So, as Jesus was mocked, spit upon, beaten, crowned with thorns, given a bogus trial, levied an unjust judgment, had his flesh ripped and torn by the instruments of scourging, made to carry the heavy beam of the cross up the hill and finally nailed to it, Mary was there. She witnessed every moment of it and suffered along with her son. At the same time, she couldn’t do a single thing about it because she knew it was the Father’s will and trusted in his wisdom. Her suffering, childlikeness and trust was rewarded on Easter Sunday when her son — Our Lord Jesus — rose victorious from the grave. As we celebrate the resurrection, perhaps we could meditate on Mary’s great joy and invite her to celebrate Easter with us. Fenelon is a freelance writer from Milwaukee.